It's been ironic reading so many positive comments about Cadbury, in a batch of essay assignments, in the week its directors recommended the proposed acquisition of the business by Kraft. One comment in particular seems worth revisiting. The now-famous bring back Wispa campaign was cited as a good example of relationship management (in the way the company apparently did a U turn and responded to its customers' wishes). The same campaign is also named by Phillips and Young as a good example of 'groundswell' – using social media channels for campaigning purposes. What if it's neither of these? What if the bring back Wispa campaign was an example of an old-fashioned PR stunt out of Barnum & Bailey, or from Grunig and Hunt's bad old press agentry/publicity model. You see, our transparent age of social media is meant to make the old-style PR stunt ineffective (unacceptable too). So it's awkward to find an example of it working so well – and the source of the campaign being able to cover their tracks. So, based on a nudge and a wink more than hard evidence, I name Borkowski as the PR brains behind the Wispa campaign. (He continues to deny it publicly but he's probably made the commitment to do so to the client). Let's please stop using it as an example of the crowd versus business. It's an example of PR orchestration simulating (and stimulating) public opinion. We think we're so sophisticated, but it seems we're still suckers for the old gags. Freddie Starr ate my wispa. In a world of email and electronic communication, an official-looking letter carries extra credibility. When what looks to be a bill reminding me of the need to renew the prstudies.com domain arrived, correctly addressed to me, I wondered whether I needed to act. I had only changed the registrar last year so at first sight this letter looked believable. The only thing is, it's not from my registrar. The information that gave the letter credibility (the domain name, my name and address) are all in the public WHOIS record – exposing the limits of transparency. This is an attempt to snare business unwittingly. On re-reading the letter it's carefully worded ('as a courtesy to domain name holders…') to avoid untruths – but you can be legal and still unethical. It's another example of legal advice running counter to public relations advice. This is a reputational issue: Google search results give many warnings of this attempted scam, so I'm posting this to add my voice. You might think I'm five years behind the times, but the impact of technology is not linear, nor is it always predictable. The Economist tells how commentators predicted in the 1840s that the telegraph would challenge newspapers. Instead, faster transmittal of news led to the era of the great newspapers. The internet may kill newspapers; but it is not clear if that matters. For society, what matters is that people should have access to news, not that it should be delivered through any particular medium. So we don't have a crisis of news; we have a crisis of news distribution and the need for a viable business model. Here's my thinking about blogs. The first phase, championed by Blogger, Typepad and others enabled easy personal publishing. Yet growth in and buzz around personal blogs slowed as first social networks (like Facebook) and then microblogging (Twitter) satisfied most people's needs for expression and interaction. Blogging hasn't gone away, but it has become less visible as the early adopters have been exploring new new tools. Yet quietly, this personal publishing platform has been developing into professional publishing. Open-source WordPress has been leading the way in this, as personal blogs give way to group blogs and sophisticated content management systems. This development should not be surprising as it has a precedent. Newspapers emerged from the explosion of pamphlets enabled by the printing press (a disruptive technology in its day). At first, these pamphlets were personal and amateurish; in time, they became more professional and evolved into the newspapers whose names we're still familiar with. So, in predicting that 2010 will be the year of the blog, it's not personal, amateur blogs that I have in mind. It's well-researched, professional blogs in specialist niches such as politics and business. The UK general election campaign will provide a local boost to the political blogs, and the challenge of the recession will boost the adoption of low-cost approaches to marketing and communications. There's another factor in this trend. For many individuals, social networks and Twitter are alternatives to blogging. For the more professional bloggers, these networks provide valuable 'push' channels for attracting readers and encouraging the creation of communities of interest. We've long been familiar with the role of the public relations practitioner as content creator. There's work here for those who are far-sighted enough to establish strategies and rationales for blogging engagement along with robust systems for writing, editing and moderation, while avoiding the obvious pitfalls of ghost-writing and the constant conflict between transparency and disclosure. Then there's the emergence of a new role: the public relations practitioner as community engagement manager (with a blog one possible hub for the community). "When you think of news instead as the province of an ecosystem that is distributed and owned at the edges by many players operating under many means, motives, and models, then the notion of contribution, ownership, and control changes. People own their own stakes but they benefit by joining together cooperatively. They create a tide upon which all their ships rise. That’s a network, not a company." Among the comments, someone points out that this is idealistic. Yet Jarvis cites some thriving examples of the community model (Wikipedia, Craigslist) and idealism begins to look realistic once all other avenues have been explored. Apart from the importance of news channels to public relations, there are wider implications here too. It's possible to see public relations in a community engagement role; its purpose being legitimacy and licence to operate over the longer term rather than short-term profits. It's interesting to watch the diffusion of news and chatter as a story breaks. Coca-Cola takes a £30 million stake in innocent. Most of us will have heard this first from the media, or will have checked the media for verification. You can also read innocent's news release (note the carefully worded title). Round one to the media. Then the chatter and analysis begins. Many are comparing this to those other niche, eco brands taken over (or bought into) by large corporations: Ben & Jerry's, Body Shop, Green & Black's. There's some discussion on blogs, but the most telling contribution is that of Stefan Stern for the Financial Times. Round two to the media. For the authentic, instant and unmediated reaction of the crowd, we turn to twitter. 'No, not innocent at all. Am thinking about a boycott!' Nick Band, a PR consultant, manages to be literary in 140 characters: 'Age of Innocence over as Coke buys Innocent'. Many more take a similar theme. Round three to the people. Public relations and public affairs was the fastest growing communications services sector on a like-for-like basis. New technologies and new media have, once again, demonstrated the power of editorial publicity through fast-growing new applications such as MySpace, YouTube, Facebook, Flickr and Wikipedia… In addition, public relations and public affairs have benefitted [sic] from the impact of polling techniques, which have provided a more scientific basis for the industry. Some ideas quickly seep into the public consciousness so that they seem always to have been around. 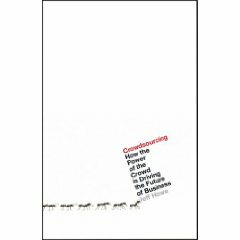 Yet Crowdsourcing (not to be confused with Crowd Surfing or The Widsom of Crowds) is a new book based on an idea first published in a 2006 Wired article (following in the slipstream of The Long Tail). The writer Jeff Howe is careful to point out that he is not describing a new concept. He cites a long cultural tradition and Adam Smith's 'the invisible hand' as precedents. Yet the book inevitably draws its examples from the Web 2.0 economy of 'user generated content'. In summary, it's cheaper, smarter and less risky to involve the crowd in solving problems and in developing products than relying solely on employees. Examples are drawn from the Open Source movement, music and entertainment (American Idol and computer games), and commercial photo sharing (iStockphoto). In this, Howe agrees with Clay Shirky, whose Here Comes Everybody (now out in paperback) has stolen some of the attention away from this book. For there's a 1:9:90 rule of user engagement (called participation inequality by Jakob Nielsen, though he's not cited in this book). For every hundred people on a site, only one will actually create content, another nine will comment on what has been created while the majority will simply lurk. The maths works out for Wikipedia (though a small few create most of the content) and for American Idol, though most communities will struggle to gain critical mass. There are lessons in this for so-called citizen journalism, though Howe takes a balanced view: 'We are all better served when the crowd complements what journalists do, rather than trying to replicate it.' There are lessons for marketing because co-opting the crowd into research and development creates by this process a ready market for the resulting product (eg Threadless t-shirts). Lessons for public relations are not made explicit, so I'll suggest them. One is that the crowd is the public, so we should by definition be experts in forging relationships with them. Another is that we need to focus on the quality of these relationships – public engagement in Richard Edelman's phrase – and community building brings many potential benefits. Last (not least), Google is now the key player and so links – the key to PageRank – are themselves a form of community and a benefit of community building.